Spin that ball! Roulette Royale by MyWavia Studios is a must download for Roulette gamers. This free gambling app feels just like you are sitting at the Roulette table in Vegas, except that you are playing with free money! Whether American or European Roulette is your game of choice, Roulette Royale offers you endless amounts of fun on your mobile screen. 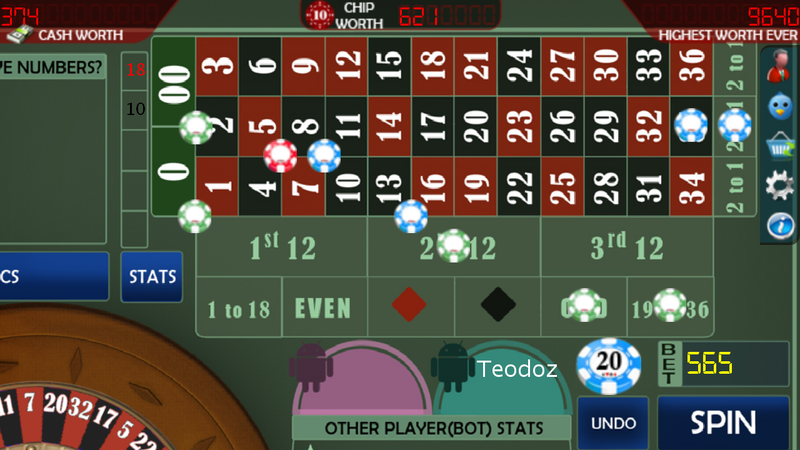 Play against other “Bots,” putting all your chips on Red or be a real gambler and bet the pay lines. 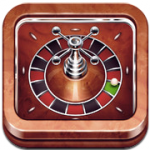 The Roulette Royale app is an exciting new addition to our mobile gambling app collection. This app is a must have for all the Roulette game lovers, allowing you to enjoy both American and European style of gaming. The game also allows you to enjoy various social aspects, along with some of the very best bonuses! For the app to run properly, a minimum of Android version 2.3 is required. Other than that, a minimum of 500 MHz processor and 512 MB of Ram if enough to suffice its needs. The game is playable in both the portrait and landscape modes, however, we do recommend you to play it in the later mode. The app features an excellent mobile gaming interface. It is amazing how they pack all the elements of Roulette game into a compact format. The colors used in the app lead to a subtle and elegant impact on our minds. The background score is soothing, helping you hold on to your nerves while gambling. Invite your Facebook and Twitter friends to spin with you and challenge them to see who the ultimate Roulette champion is. You can view the Roulette net worth of your friends and brag to them about how much better of a gambler you are. There is even an awesome Roulette Royale Hall of Fame that shows the global leader board and how you stack up against the all-time greats. The impressive backgrounds and overall graphics of Roulette Royale work wonderfully on Android and Apple smart phones, but the real spinning good time is on tablets, where the Roulette table feels very lifelike. One slick feature of Roulette Royale is that you can shop for virtual high roller items, like Rolex watches or even a trip into outer space! The pop-up ads in the app are not as overwhelming as in other casino apps, and you can avoid a lot of that by utilizing the sweet offline option. That will limit your ability to play against your friends, however. 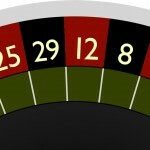 If Roulette is the game you play the most in other casino apps, then this gambling app may just be for you. It is a great way to kill some time while you wait for the train or the bus, but may get old quickly for those who are not big Roulette spinners. Daily bonuses have recently been added which make the app more enticing. 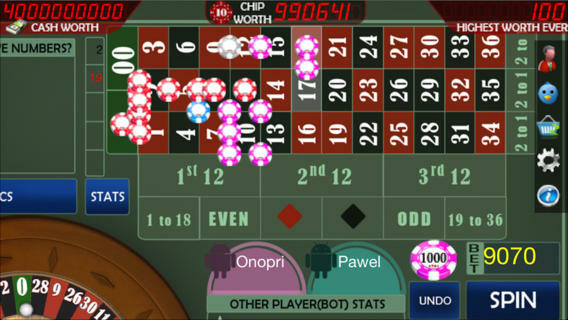 Were you looking for roulette apps that allow you to win real money? You might want to check out our roulette apps for real money section. 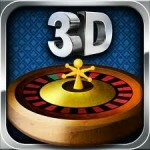 There’s a list available with the best apps offered by real online mobile casinos. The Roulette Royale – Casino allows you to enjoy enthralling sessions of casino gaming. 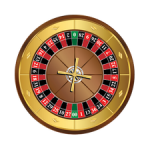 With the app you can enjoy super realistic mobile roulette gambles, watching the ball go round in real time. You can also lay all kinds of wagers on the table just like it were a real game. Both American and European style Roulette action. Bet on lines, streets or straight up directly on the board. The social aspects of the app are quite well defined. The app lets you enjoy full social integration within it, getting you the best possible experience with your friends. You can pit your Roulette skills with your friends on the leader board, while also tweeting about your latest achievements. The Roulette Royale app is a complete package, getting you the best of mobile gaming!